Teeth are important accessory digestive structures that mechanically break food into smaller pieces during mastication (mas-ti-ka’-shun), or chewing. Humans develop two sets of teeth: deciduous and permanent teeth. The deciduous teeth, the first set, start to erupt through the gums at about six months of age. 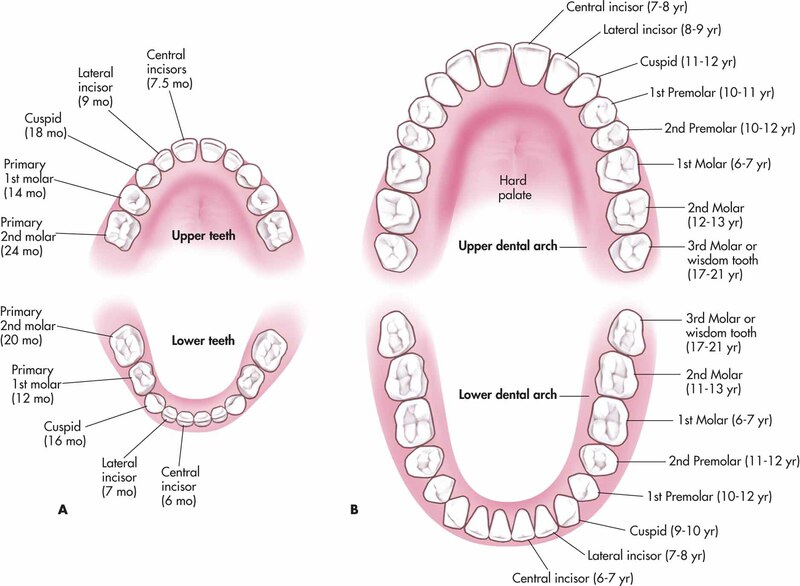 Central incisor (in-si-zers) teeth come in first, and second molar teeth erupt last. There are 20 deciduous teeth, 10 in each jaw, and all of them are in place by three years of age. Deciduous teeth are gradually shed starting at about six years of age, and they are usually lost in the same order in which they emerged. molar teeth, are in place by age 16. The third molar teeth (wisdom teeth) erupt between 17 and 21 years of age, or they may never emerge. In many persons, there is insufficient room for the third molar teeth, so they become impacted and often must be surgically removed. The 32 permanent teeth, 16 in each jaw, consist of four different types: incisor teeth, canine teeth, premolar teeth, and molar teeth. The chisel-shaped incisor teeth are adapted for biting off pieces of food. The canine teeth are used to grasp and tear tough food morsels. The somewhat flattened surfaces of the premolar teeth and molar teeth are used to crush and grind food. Each tooth consists of two major parts: a root and a crown. The crown is the portion of the tooth that is exposed and not covered by the gingiva (jin-ji-vah), or gum, covering the underlying bone. The root is embedded in a socket, called an alveolus. A hard substance called cement attaches the root, through tough periodontal ligaments, to the alveolus. The junction of the crown and root is known as the neck of the tooth. Most of a tooth is composed of dentin, a hard, bonelike substance. The crown of the tooth has a layer of enamel overlying the dentin. Enamel is the hardest substance in the body and it is appropriately located to resist the abrasion caused by chewing hard foods. Each tooth is supplied with blood vessels and a nerve, which enter the tip of a root and pass through a tubular root canal into the pulp cavity of the crown, a central space in the crown of a tooth. Together the pulp cavity of the crown and the root canal form the pulp cavity of the tooth. In a molar tooth, the pulp cavity of the crown is relatively large and roughly box-shaped. But in a canine tooth, the pulp cavity of the crown is an elongated enlargement of the root canal. Dental pulp is soft areolar connective tissue that fills the pulp cavity and supports the blood vessels and nerves.